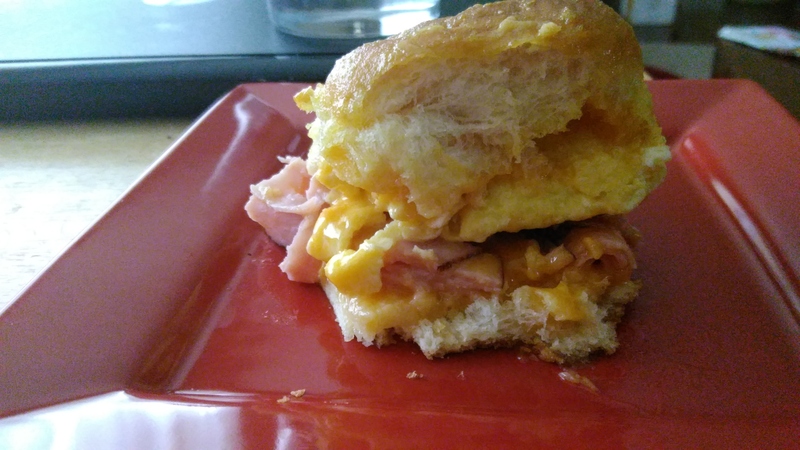 Breakfast Sliders – What's for Dinner Moms? My family loves breakfast for dinner every once in a while. I like breakfasts for dinner because they tend to be super easy and everyone loves it! These sliders are a take off on several other sliders I have made including Meatball sliders, Reuben sliders (one of my most popular recipes to date), and of course the original slider sandwich recipe. These were a hit just as I expected. The hardest part? Scrambling 10 eggs. My daughter put these together in about 15 minutes. The strangest part to her was the topping for the rolls but once I convinced her to try it she was so glad she did. It gives the rolls even more flavor than you expect them to have. Tip: When scrambling the eggs try not to break them up into small pieces as you normally do when cooking them. You want nice, large, fluffy chunks to place over the rolls. Cut rolls in half horizontally so you have a sheet of tops and a sheet of bottoms. Place bottoms in a 13 x 9 baking dish. Cover bottoms of rolls with half the cheese. Then place a layer of half the ham over the cheese. In a large skillet over medium heat cook scrambled eggs. Try to leave them in large chunks not small bites. Place cooked eggs over ham. 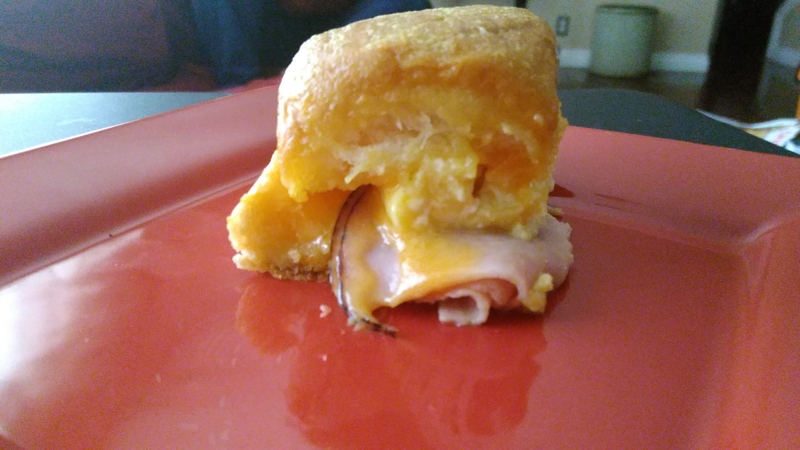 Cover with remaining ham and cheese. Add tops to rolls. In a small bowl combine melted butter, mustard and brown sugar. Brush tops and sides of rolls with the mixture. Bake 12-15 minutes until tops of rolls are golden and cheese has melted. All to rest 3-5 minutes before cutting rolls. 🙂 We aren’t totally weird either I guess! Mustard and brown sugar…….really?? I can’t even imagine but these sound so look good!! Yes! I actually use brown sugar and mustard as a glaze on hams studded with whole cloves. It really is good. The butter helps it spread and cook in here. Those look wonderful! I love breakfast for dinner, and lunch sometimes. It’s right on top of the list when it comes to my favorite meals. Thank you. I am anti-runny eggs. I like them firm. Picky too. LOL Check ingredients-you crack me up Marci!! At last someone actually reads your recipes! Grrr. Thinly on my phone. I want my computer back! Best memories for them I am sure! Thank you. My son ate 3-4 and probably would have had more if I let him! You’re welcome. He was really on a roll! We love such breakfasts on weekends although true, this fits all day!! Printed!! These look gorgeous. I’ll have to try them for Jimmy’s lunch some day. He has a pain in his arse eating ham sambos! Thank you! They reheat well too! Wrap in a damp paper towel and put in microwave for a bit. Interesting. When I make similar things I fry the eggs. On both sides. Until crispy round the edge. Yes, I’m fussy too. Scrambled is much more sophisticated. Thanks! Hope you like them.